Preferred Habitat: Pumpkinseed are somewhat indiscriminate in habitat selection. They occur and reproduce successfully in all waters, even brackish coastal waters. As long as the water quality is adequate and food is available, pumpkinseed will thrive. Food Habits: Pumpkinseed feed primarily on insects and other invertebrates. Spawning: Pumpkinseed spawn early in the summer as water temperatures exceed 70° F. The males will construct nests in shallow water either singularly or with other pumpkinseeds or even with other species of bream. The males develop and display colorful body patterns to attract females. The female will lay 2,000-3,000 adhesive eggs into the sandy bottom of the nest. These are fertilized by the male, guarded throughout incubation and protected during the early developmental stages of recently hatched fish. 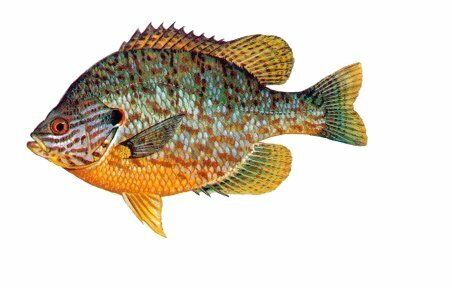 Miscellaneous: Pumpkinseed often hybridize with other bream species. They will also reproduce more than once if conditions are favorable. Pumpkinseed are often confused with redear sunfish; however, they do not obtain harvestable sizes as often as redear.